Apparently a fear of heights is the single most common phobia affecting us humans. Nearly one in 10 are afflicted and that spectrum ranges from not liking them to being downright terrified at the prospect of even climbing a ladder. I’d say I probably sit towards the upper end of the scale and have got worse as I’ve got older for some reason. But one of the most liberating and exciting experiences I’ve had in my life at nearby Center Parcs Woburn Forest has changed all that. Center Parcs has come a long way since its first Village opened at Sherwood Forest in Nottinghamshire over 30 years ago in July 1987. Now in 2018 there are five Villages to choose from across the UK including Sherwood Forest, Elveden Forest in Suffolk, Longleat Forest in Wiltshire, Whinfell Forest in Cumbria and the newest addition Woburn Forest in nearby Bedfordshire, a stone’s throw from Milton Keynes. While each resort aims to have it’s own unique features to sit alongside the usual abundance of activities, restaurants and relaxing pursuits, only Elveden and Woburn have The Drop. The name ‘THE DROP’ sounds daunting doesn’t it? Well it is to be honest, especially as you approach it and realise it’s even higher than you first thought. The sense of fear, anticipation and excitement is ramped up as you are harnessed in the necessary gear, checked and treble checked by the super friendly staff. The Drop is billed as the ultimate test of bravery and I’m a bit of a coward to be honest! But with my 10 year old daughter joining me for the experience I could make her go first. Of course I’m joking... but she did seem to be talking me round a lot more than I did her! I tried not to read too much about it before taking it on as I didn’t want to put myself off and my first thought was that you get up to the top and take it in turns to drop from a great height, dust yourself down and get back to the Pancake House to celebrate. Well there’s good news and bad news if you’re scared of heights. The bad news is this adrenaline-fuelled activity takes you one way up a 10 metre outdoor tower, then gives not one but FOUR challenges and SEVEN drops in total to make your descent back down to ground, with different levels to test your bravery. The good news is that means it is brilliant value for money and believe me when I say this will be one of the best things you have ever done. On one side of The Drop tower is a double drop zip wire. This offers a gentle start to proceedings easing you in but it still takes some will power to push off from the edge and the relief is immense as you glide down to the floor. Then comes the quick jump and this ramps things up a lot as you step off the wooden platform backwards and experience a zero gravity freefall before the harness takes your weight and lowers you to the ground. It’s exhilarating but brief. Then came the bit which made it for my daughter and I - and our family cheering us on below - the Leap of Faith. Here you jump from the platform towards a punch bag dangling in mid-air and try to grab it and hang on before letting go and being lowered back down to earth. There’s an element of Ninja Warrior meets Total Wipeout about this but when you are up there there’s no Chris Kamara or Richard Hammond cracking funny jokes. Instead you are left in the hands of The Drop’s intrepid staff. These guys, besides being hilarious and very thorough, could moonlight as stand-up comics and they really do put even the most terrified of Droppers at ease (being told you’ve been signed up to the extreme package never gets old!). In fact I’d go as far as to say they make the experience what it is. After repeatedly telling them I was a health and safety inspector when they asked what I did for a living, I decided to go first and it took every ounce of courage I had to leap from that platform. I think I used all my energy up just persuading my body to jump because I didn’t seem to have any left as I grabbed the bag and it instantly slipped from my grasp (no it has nothing to do with my lack of upper body strength and general conditioning... I’ll let you be the judge from the video above). Then came the moment which made my entire break, standing below watching and filming as my daughter, one of the world’s worst worriers flew off the platform and grabbed the bag to a big round of applause. A special moment I’ll never forget... isn’t it amazing how proud you are of your kids when it comes to things like that. A side note on this one is that you can ask the staff to alter the difficulty of this level, by choosing the distance between the punch bag and the platform, making the leap shorter or longer. Just as your heartbeat starts returning somewhere close to normal, you move on to the final section, the Air Bag jump. And this is where you realise the Leap of Faith was a piece of cake. Standing on top of the platform I watched people enjoying themselves in pedal boats on the lake, cycling in family groups, playing adventure golf and even chilling out in the luxurious Aqua Sana Spa as the steam rose up from the outdoor relaxation pool. It was then I wondered why the hell I’d chosen this, but I was about to be fully vindicated...eventually. Here you leap from the platform, with no harness or rope, and freefall until landing safely on a giant inflated cushion. Your nerves - and ability to carry out the correct landing technique - are tested with jumps from the warm-up 4.5 metre platform before moving up to the 7 metre platform and finally the ultimate challenge: jumping off the 10 metre platform. For this one I let my little girl go first... told you I was a coward. I said eventually just now because this was the one where people struggled most to actually get themselves off the platform due to the fact it is a freefall. It is hilarious watching someone else going to jump but stopping themselves as their brains and bodies tell them otherwise. I can only liken it to what I imagine it is like to attempt a skydive. But in hindsight there really is nothing to worry about with the bag making for a remarkably soft landing. The fact you get three goes at this is fantastic but there is no pressure to go to the top of the platform which I thought was great. Jumping from 10m up and freefalling was truly one of the most memorable experiences in my life but just in case you forget you are handed a cool Drop pinbadge as your medal of honour on the way out. Of course as ever at Center Parcs you can be as active or inactive, as adventurous or boring as the mood takes you and that is the beauty of it here. There’s a lot to be said for going away to sunnier climes to a luxurious hotel with swimming pools. But once there you are kind of limited to sunbathing by the pool and the various bits and bobs that may or may not be going on in and around whereever you choose to go. 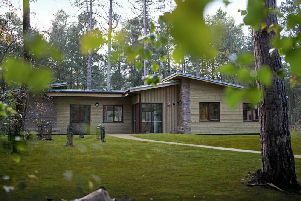 At Center Parcs you have genuine freedom of choice in everything you do which is why it is so popular. Whether that’s enjoying the Subtropical Swimming Paradise and it’s brilliant slides and outdoor rapids, cycling, bowling, den building, pottery, cake making or just chilling out in the many restaurants and bars or even back at the wonderfully modern lodges, there literally is something for absolutely everyone of all ages. What sets Woburn Forest apart, though, is The Drop, which is fast becoming it’s unique selling point. The resort has a lot going for it given it’s proximity to many of the big areas in the Home Counties and Midlands, the fact it is one of the smaller forests and that it is new. The Drop takes it to another level, though, offering the kind of thrills only experienced on some of the world’s biggest rollercoasters. Not only was taking the challenge of the Drop a tent pole moment in mine and my daughter’s lives - something we will never forget - it also served to help ease if not fully conquer my fear of heights with no need for hypnosis (although there are that many activities to choose from I wouldn’t bet against it being somewhere on the list!). Family time has never been better spent than at Center Parcs and Woburn Forest has one of the jewels in the crown with The Drop. And not just for the 10m wooden platform that is akin to a medieval lookout tower, but the staff and other Droppers that take the challenge with you who truly make the experience special.